Food is like fashion. There are some trends that flash then fizzle, while there are classics that withstand the passage of time – just like a little black dress. 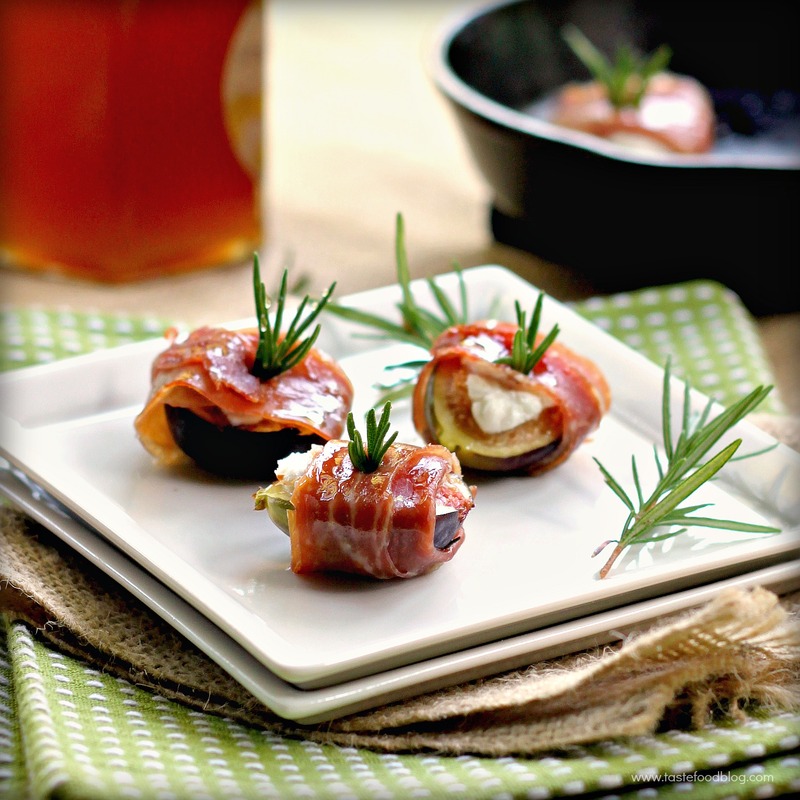 The combination of figs, goat cheese and prosciutto falls in the little black dress category. Each ingredient is a specialty hailing from the cuisines of the Mediterranean, reflecting locally grown and raised food with a history spanning the ages. And they taste great together. No fancy accoutrements are needed – this is the stuff of slow food. Whether you call it timeless or simply delicious, the common denominator is it strikes a primal chord in all of us, bringing us back for more. 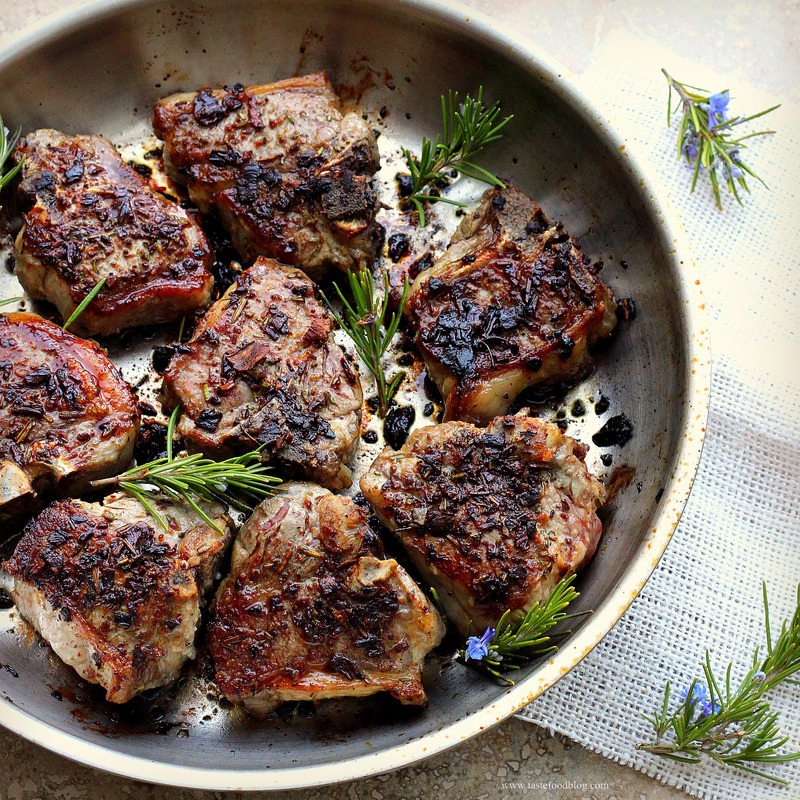 This recipe showcases the ancient fig, one of the first plants cultivated by humans. Figs are high in calcium, fiber, potassium and contain many antioxidants. Luscious and honeyed, they are delicate in flavor. Their subtle sweetness is an elegant addition to savory dishes such as pizzas and salads, while their mildness adds refinement to desserts, never tipping the sugar point. Classic, understated and refined – all of the makings of timeless food and good fashion. Fresh rosemary sprigs serve as toothpicks in assembling the figs while infusing flavor during the baking. 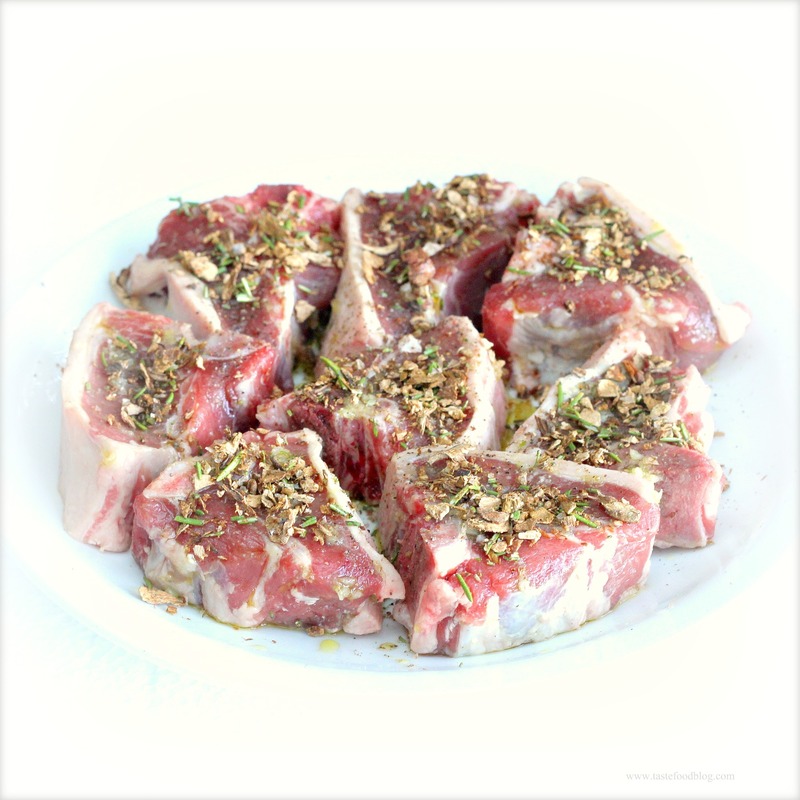 Makes 12 hors-d’ouevres, or serves 6 as a salad course. Cut the figs crosswise from the top, halfway down the fruit. Gently separate the quarters to create an opening. Scoop 1-2 teaspoons goat cheese into the opening, without overstuffing. Wrap each fig with prosciutto slice. 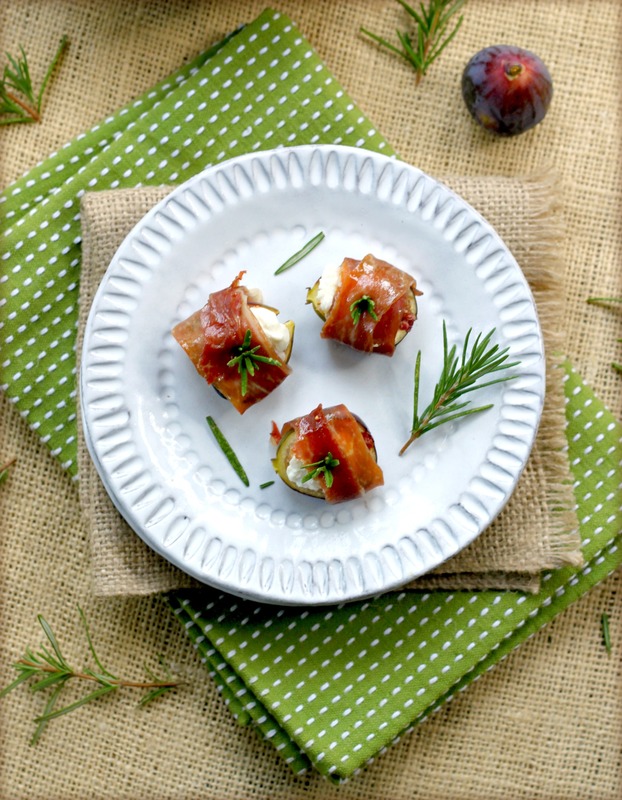 Pierce the prosciutto and fig with a rosemary skewer to hold in place. Arrange figs in a baking pan. Gently brush with olive oil. Sprinkle with a little salt and pepper (the prosciutto will also add salt). Bake in oven until prosciutto begins to crispen and cheese is tinged brown, about 25 minutes. Remove from the oven. Carefully remove and discard baked rosemary sprigs. Arrange figs on serving platter or individual plates with fresh arugula (optional). Drizzle each fig with honey. Garnish with fresh rosemary leaves. Serve immediately. 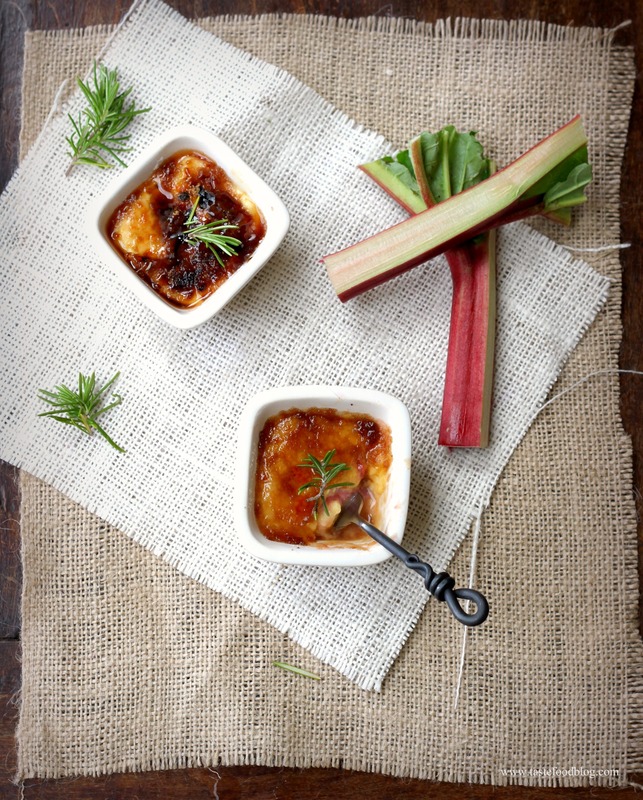 Rhubarb and rosemary are surprising bed fellows in this not-so-classic crème brûlée. Upright, brilliantly hued rhubarb is always the first to arrive to the spring party. Its astringency may be overwhelming, but with some sugar coating and frequent pairing with the indefatigable strawberry, rhubarb’s tartness is successfully tamed. For this dessert, however, I did not want to rely on the dependable strawberry, which would add further sweetness and more liquid to the rhubarb compote. I wanted a subtle background flavor that would tickle the tongue and ground the ethereal creaminess of the custard without approaching the sugar tipping point. I happened to have fresh rosemary sprigs lying on the kitchen counter as the rhubarb simmered on the stove. Their woody aroma mingled with the wafts of steam rising from the compote. It smelled magnificent. I tossed a sprig into the pot of rhubarb and another sprig into the cream to infuse the custard. The results were subtle but notable, producing a crème brûlée that is at once rich and creamy, sweet and tart, earthy and heavenly. Combine rhubarb, 1 rosemary sprig, 1/2 cup sugar and lemon zest in a saucepan. 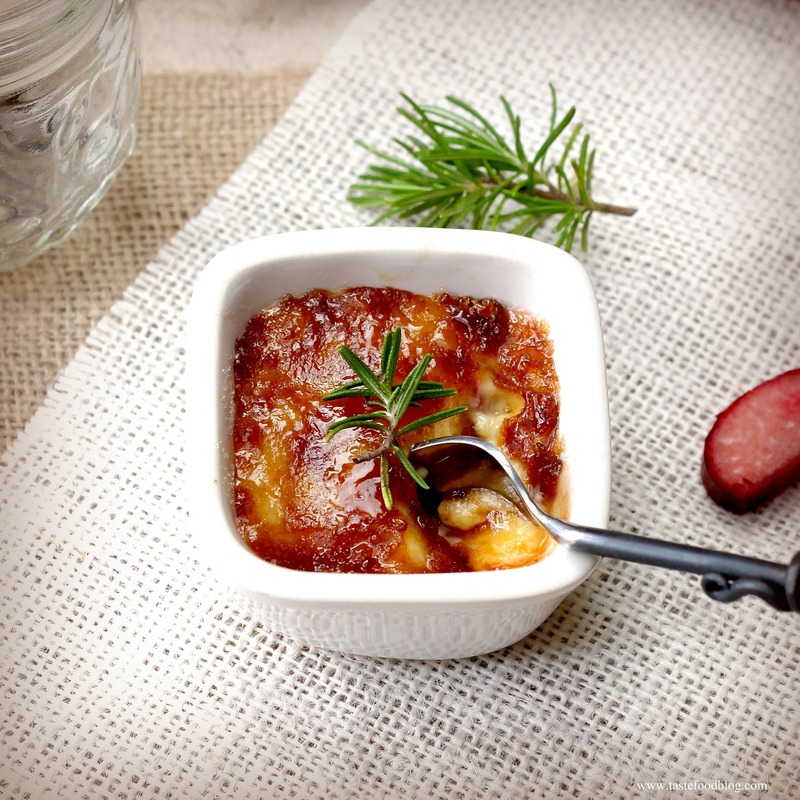 Cook over medium heat until the rhubarb is soft but still retains its shape, about 15 minutes. Remove from heat and cool to room temperature. Remove and discard rosemary sprig. Preheat oven to 350 F. (180 C.) Heat cream in another saucepan over medium heat just until it begins to boil. Remove from heat and add 1 rosemary sprig. Let stand 15 minutes to infuse. Strain cream through a fine meshed sieve into a bowl. Discard solids and rosemary sprig. Arrange 6 shallow (1/2 cup) ramekins in a baking dish. Divide rhubarb among ramekins. Whisk egg yolks and 1/2 cup sugar together in a bowl until light. Add cream in a steady stream, whisking gently to avoid making air bubbles. Ladle the cream mixture over the rhubarb into the ramekins. Pour boiling water into the baking pan half way up the ramekins. Bake in oven until custard is just set but still wobbly, about 40 minutes. Remove from oven. Cool in bain maire for 15 minutes. Transfer ramekins to a rack and cool completely. Cover with plastic wrap and refrigerate at least 4 hours, preferably overnight. Cut the figs crosswise from the top, halfway down the fruit. Gently separate the quarters to create an opening. Scoop 2-3 teaspoons goat cheese into the opening, without overstuffing. 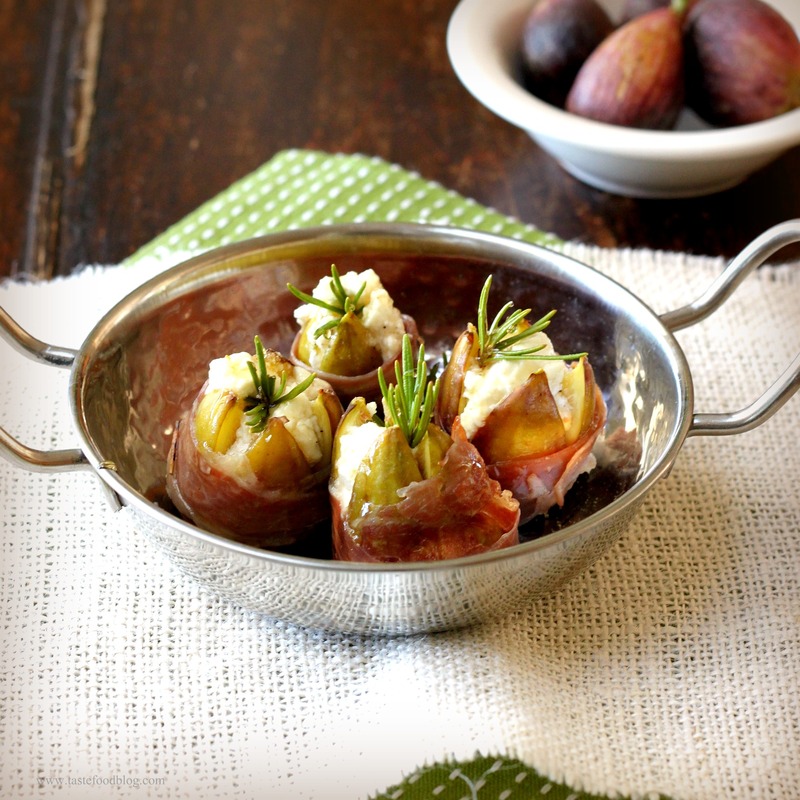 Wrap each fig with prosciutto slice. Arrange figs on baking tray. Lightly drizzle with olive oil. Sprinkle with salt and pepper. 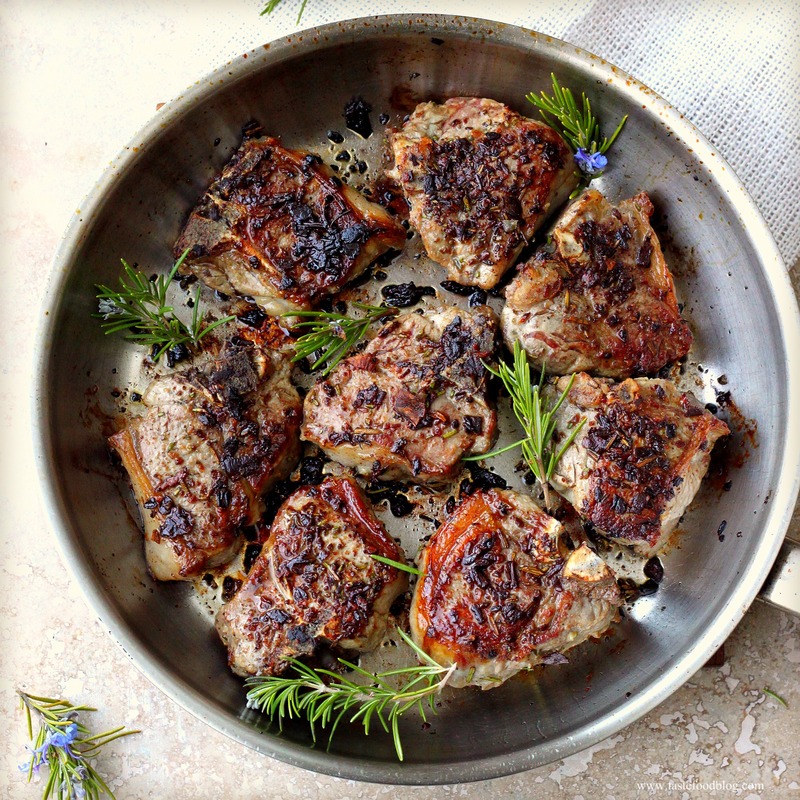 Top each fig with rosemary sprig. Bake in oven 25 minutes. Remove and discard baked rosemary sprigs. Arrange figs on serving platter or individual plates. Drizzle each fig with 1 teaspoon honey. Garnish with fresh rosemary leaves. Serve immediately accompanied with fresh baguette slices. Optional: Arrange figs on bed of arugula, or garnish platter/plates with arugula sprouts.